Tinolang Manok is truly a Filipino dish that conjures comfort and delight. This dish has been with us since the Spanish era as testified in our Jose Rizal's Noli Me Tangere, where tinola was served for the gathering at Kapitan Tiyago's and Ibarra, being the most distinguished guest, was served the best chicken parts much to the chagrin of Padre Damaso. 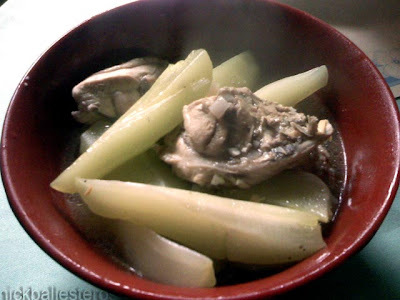 Tinola is inherently chicken soup that is very easy to make, and the ingredients are readily available at the local market. We had tinolang manok last weekend in Baguio City, where a storm kept everyone in their homes and electricity service was shut-off. It was a good thing we had chicken and sayote at home! And so we had hot, yummy tinola with rice to keep us company on that cold and rainy Sunday afternoon. In the wok, pour cooking oil and saute the garlic, followed by the onion and ginger when the former turns translucent. Add the chicken and stir-fry. After just a couple of minutes, add the water to submerge the chicken. Cover and bring to a boil, then simmer. When chicken is cooked, add salt to taste. 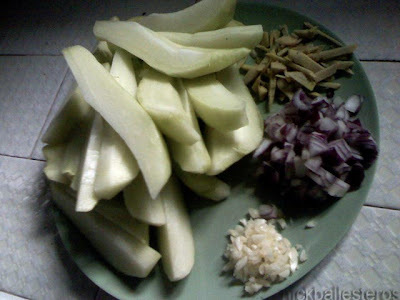 Add the chayote wedges. Cover, but occasionally monitor the chayote. If it can already be pierced by a fork with a bit of resistance, then it's cooked. Finally, turn off the stove and add the dahon ng sili. Serves 2 adults and a kid, with some left for dinner!